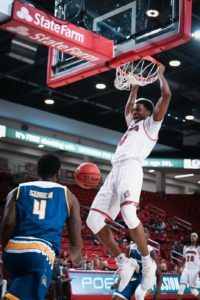 USD men’s basketball played their first home game in 19 days Saturday, and came away with a 68-56 victory over California State-Bakersfield. The four-game road trip, including three games in the Bimini Jam, did not turn out the way first-year head coach Todd Lee and company hoped. 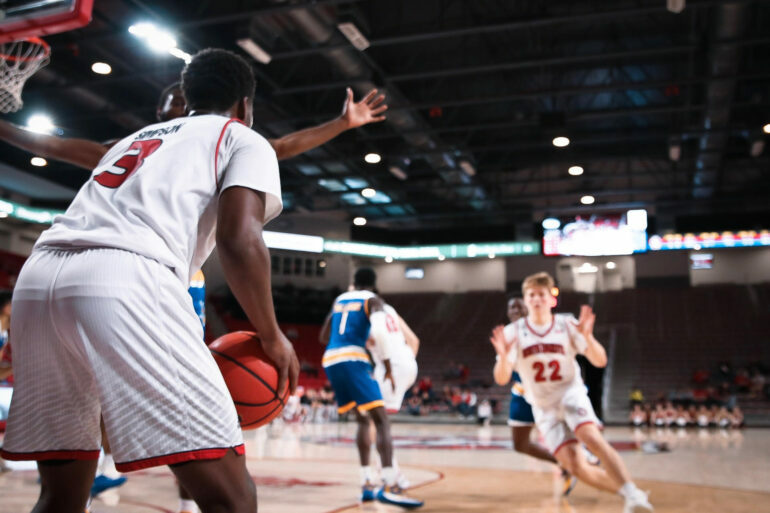 After losing three of four games by six points or less, the Sanford Coyote Sports Center was a welcome sight for the team. USD built a 14-point halftime lead, in large part to 11-20 (55 percent) shooting and 11-13 (85 percent) from the free throw line. The Coyotes received a big lift off the bench in the first half from sophomore guard Stanley Umude, who finished the first half with 16 points and five rebounds. Senior forward Trey Burch-Manning received three personal fouls in the first half, limiting his action. The bench for the Coyotes continued to produce in the second half. Power scored all 11 of his points in the second half. Umude finished the game with 19 points and eight rebounds. Junior guard Tyler Peterson added 14 points. Burch-Manning finished the game with nine points and seven rebounds. CSU Bakersfield had 12 different players come in during the first half of play, with Sophomore guard Jarkel Joiner and redshirt-senior forward James Suber leading the team with five points each. Redshirt-senior forward James Suber led the Roadrunners with a double-double of 14 points and 11 rebounds. Senior guard Rickey Holden contributed 14 points and sophomore guard Jarkel Joiner scored 10. The Coyotes held the Roadrunners to 37.3 percent shooting (22-59) and shot 19-42 (45 percent) themselves. USD was effective from the charity stripe in both halves. They finished the game 26-31 (84 percent) on free throws and three players–Brandon Armstrong, Peterson and Power–were perfect. Lee, whose team is off to a 4-3 start, said they expected a game decided on free-throw shooting. Up next for the Coyotes is a trip to Boulder to take on Colorado (5-1) Tuesday, Dece. 4, at 8 p.m. The Coyotes return home Saturday, Dec. 8 to take on Missouri-Kansas City (2-7) at 1 p.m.